Earlier this month, the 2015 model year diesel Volkswagens were approved by the EPA and California Air Resources Board for an emissions software modification. Those fixes have now begun rolling out to customers, and while some first impressions by forum-goers indicate that the repair may make the cars more sluggish, overall sentiments actually seem pretty positive. Owners were worried that, when VW came out with a fix for their polluting diesel cars, it would involve a huge decrease in fuel economy and acceleration. But based on initial thoughts from TDI Club Forum members, it looks like Phase 1 of the modification doesn’t do much to fuel economy, even if it might make the cars feel slightly slower. I do notice some performance issues. The car appears to be sluggish on the start. It also appears sluggish when going from 4th to 5th gear and from 5th to 6th. The pickup just didn’t seem to be the same to me..
On the start I have used the sport mode and that seemed relatively close to what it was before. Without the sport it definitely feels like like I’m hauling something. ﻿Okay, so I just got back from picking up the car..I only managed to take a quick spin on the interstate and around town a little, but so far so good. I am not a car expert, by any means, but this is my daily driver, and from what I can tell, not too much has changed, and what has is actually better (a bit). One thing is it used to have a bit of lag from a stop that I had pretty much gotten used to. This lag now appears to be gone, and it seems to jump from first to second gear pretty quickly and smoothly now in D. It actually made it feel quicker off the line (this may be an illusion). So this owner admits that the car may not actually be faster, and that it’s probably an illusion since they no longer has a “hesitation” when applying the throttle. roni024 attributes this improved acceleration to the gearbox being re-calibrated (but this owner expects the acceleration to return to normal—i.e. slower— after a bit of driving). bluebus went on to say that, even if the car “felt” quicker off the line, it did appear a bit slower when trying passing maneuvers at highway speeds, admitting that he’d “need more time driving to be sure of this.” Sport mode, he said, feels the same. It’s too soon to tell about the mpg, but the display is still giving me about the same average as before dropping it off. Hope this helps a little to those who are wondering. The car drives slightly different in D and almost imperceptibly different in S. By different I mean the car accelerates more smoothly, albeit slightly more slowly in D, simply more smoothly in S, and will auto-up-shift in M before the redline. Does it feel like the same car? In D, 95% yes. In S, 98% yes, in M 99% yes... I’m perfectly happy with the results of the update. The changes are super minor in my untrained, subjective, inexpert, opinion. All in all, we think VW did a great job in putting a fix together for the gen 3s. All in all, it seems like these three owners are reasonably content with the fix. Volkswagen admits that the changes to these 2015 model year VWs (equipped with the “generation 3" diesel engines), doesn’t bring pollution below federal emissions standards, but it does improve NOx pollution significantly without affecting performance. 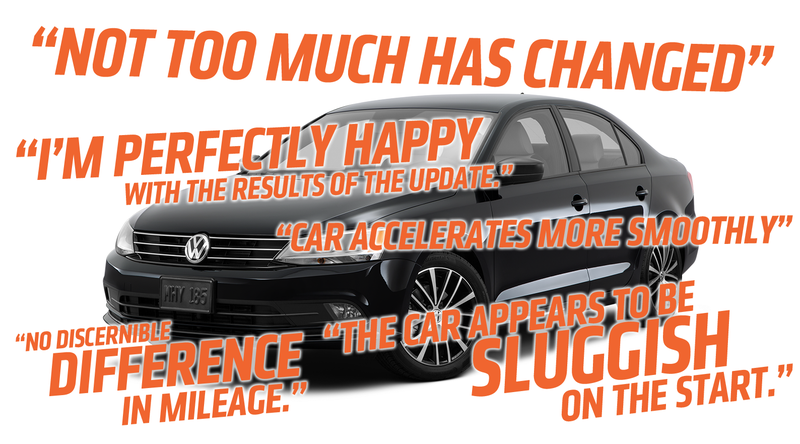 Based on the impressions above, VW’s claims seems mostly right, other than the sluggish driving bit. But those are just three early impressions, and we’ll need more data points and more time to really know how this fix changes vehicle drivability and fuel economy. On top of that, the warranty applies to the EGR system, the turbocharger, the On-Board Diagnostic system, and a lot more. And it’s a long warranty, too. VW says it spans defines the the greater of two options: 1) Your car reaches 11 years of age and 162,000 miles or 2) Five years or 60,000 miles (whichever comes first) from the date and mileage of the phase 1 fix. When the phase 2 fix comes around, that five years and 60,000 miles will reset. So, yes, the buyback is a lucrative option, but the fix—with its promise of similar performance and milage, plus this warranty— looks pretty tempting as well. Diesel Particulate Filter, Diesel Oxidation Catalyst, and Selective Catalytic Reduction Converter...NOx sensor and corresponding software to improve the performance of the OBD system. VW says Phase 2 isn’t expected to affect fuel economy or performance either, but we’ll see how it all shakes out when the hardware starts going into cars next year. A fix for the other approximately 400,000 vehicles has yet to be approved. Have you gotten your TDI fixed? How did it go for you? Let us know at tips@jalopnik.com.